New Year’s Resolution! Let’s get fit! So we’re almost through our first month of the New Year! Yay! Let’s be honest though, almost everyone is still looking for ways to get into or stay in shape! Whether you’re a pro who’s been doing it for many years (kudos to you!) or someone that’s just starting to dip their feet into the sea of crazy workouts and no calorie diets, everyone here will be aboard the “train” to perfect health. A huge part of dieting is calorie counting. Though rather simple, trying to limit the number of calories consumed is much harder than just simple math! When it comes to bringing down our calories, one of the best options is to reduce the intake of fats and carbohydrates. This would be a lot easier though if all of our favourite foods weren’t chalk full of them. “But what can we do!?!? !” Luckily for all of you, there are products out on the market that are alternatives to your beloved foods, but are fit for your diet. The challenge is finding a product that you’d enjoy. 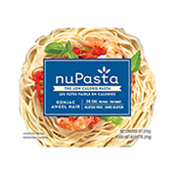 Allow me in this moment to give you a recommendation: NuPasta! “What is that?!? !” Well silly, it’s pasta! 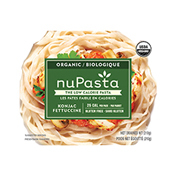 “But I thought one plate of pasta would usually be around 300 calories and full of carbohydrates!” Very perceptive of you, but NuPasta is something special! 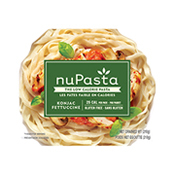 You see, the same amount of NuPasta only has 25 calories in it and has 0 net carbohydrates! 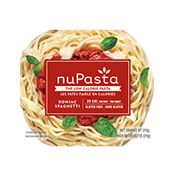 When you prepare NuPasta with your favourite sauce and toppings, it carries those delicious flavours, plus you’ll definitely be full since NuPasta is full of fibre! 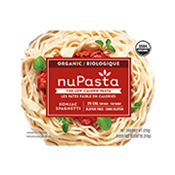 In other words, NuPasta is going to be one of your best friends as you continue your journey to the perfect body! No more starving my committed dieters and gym goers! You will be free to go about your days with a full, yet six-pack ab stomach.